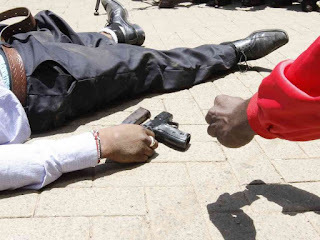 A Nairobi businessman and a private security guard were shot and seriously wounded in a robbery in Karen, Nairobi, on Sunday night. The man was shot twice in the leg in the raid at his home on 3D Lane, by a gang of four armed with AK 47 rifles loaded with bullets. The attackers stole gold, mobile phones and an unknown amount of cash. Police said the gang shot the guard when they arrived, before getting away in a car that had been waiting. They said they were searching for suspects. In an incident at Pangani on Monday, a suspected thug was shot dead in a botched robbery. The suspect and his other accomplices had been robbing motorists and pedestrians when the alarm was raised. Police recovered a pistol loaded with two bullets. 3D Lane residents association chairman David Mereka told they were concerned by the increasing number of attacks on gated communities in Karen. "We would like police to increase patrols to ensure our safety," he told the Star by phone.